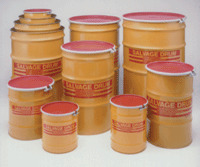 Steel overpack salvage drums are designed to contain leaks from damaged drums during storage, containment or transportation. Will accept open or closed-head steel, plastic or fiber and composite containers. Supplied with 12-gauge bolt rings, and rubber gaskets. Corrosive-resistant interiors. All conform to UN-requirements. Lined interior is available for all sizes please verify you have the price for the drum you are purchasing.